Reputation is everything, what are you doing to protect yours? The adage above could not be more poignant when it comes to running events and the associated inherent risks not the least being reputation. Event Safe Audit (ESA), a specialist audit conducted by qualified event professionals, is designed to not only protect your reputation but enhance it as well, sending a clear message to everyone that you have gone the extra mile in the pursuit of safety. An audit allowing you to benchmark your systems against host country and world standards across areas of health, safety and operational risk mitigation. ESA’s clients extend into New Zealand, Australia, United Kingdom, America, Canada and Iceland, global reach, global recognition. Events are a unique operational environment that can’t be catered by a standard audit approach. ESA’s hands on event experience coupled with tertiary and industrial qualifications guarantees a robust high integrity process that will withstand scrutiny from the highest levels. 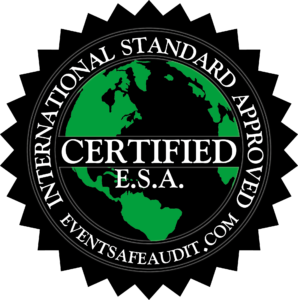 ESA is the only event safety audit endorsed by the International Festivals and Events Association (www.ifea.com). During the audit process, ESA acknowledges ISO 19011, BS OHSAS 18001, AS/NZ 4801 and applicable host country health and safety legislation. Later this year ISO 45001, the new global safety standard will also be incorporated into the process providing true global reach and application. Stage One is a bench top audit and the mandatory requirement to achieve certification. Areas inclusive of medical, communications, contingency planning, disaster recovery and Health, Safety and Risk will be examined in detail with no stone left unturned in making a determination. Stage One can be conducted remotely. Events achieving Stage One are issued a Certification Mark clearly demonstrating excellence in safety management. Stage Two is optional allowing for a higher level to be achieved. The audit process while exhaustive, is constructive with guidance provided for any areas requiring additional work in order to achieve certification. Stage Two is conducted on site during operational running and confirms all system information provided in Stage One is being implemented on the ground. Interviewing key staff and volunteers, attending safety briefings and observing operations are noted during this phase. Stage Three provides you with a dedicated safety manager for the duration, pack in/event/pack out. Bearing in mind that event builds are in essence construction zones, it’s not sufficient for a safety manager to be across event management and health, safety and risk alone, they must also be fully conversant with construction during those early stages. Who benefits from the process? The event receives expert event professional confirmation that best practice and compliance are achieved based on host country and International Standards satisfying any requirements under health, safety and risk legislation for independent external monitoring. Sponsors also benefit from the extra level of confidence an audit provides around brand association. Adding an audit to sponsorship proposals will give you an edge in a highly competitive market. This same benefit applies to host towns, cities and territorial authorities, usually the largest stakeholder, who are increasingly viewing ESA as a baseline requirement in their event application process. It allows you to streamline the decision making process while satisfying any requirements under health, safety and risk legislation. Additional protection for that all important economic benefit and positive media grab. Warwick has worked on hundreds of events from community to world level, it is this broad experience base combined with formal training that places his credentials above reproach as a specialist in event risk and ideally positions him to protect your reputation. Click here to view the Event Safe Audit (ESA) license terms and conditions. Q: How long will the audit take to complete? A: We aim to complete each audit within two weeks of receiving a complete submission. Q: Can I be audited in a shorter time? A: Yes, we can complete in under two weeks, time taken to do so is dependent on the quality of your existing system, evidence provided and your availability to address any items requiring attention. An additional fee may be charged for express turnaround due to the fact we have to prioritise. Q: Who will complete my audit? A: Our auditors are fully certified Festival and event Executives issued by the International Festival and Event Association with broad hands on event experience. This experience is augmented with the following credentials. Q: Is the audit process applicable to all festivals and events? A: Yes, Event Safe Audit can be applied to any genre of festival or event anywhere in the world. The process incorporates international safety standards and those standards or legislation particular to the host country. Q: How long will my audited status last? A: In order to retain audit status, you must undergo a full audit every three years and a review in the years in between. A: Your information is held by Safety Set Consulting, viewed by those auditors directly involved. Q: What is my audit investment? A: Stage One cost is set at $1200 for full audit and $400 for annual reviews. Full audit is conducted year one, reviews years two and three at which time you return to full audit. The audit cycle ensures continuous improvement of safety systems and processes. Stage Two and Three are completed based on hours and disbursements. A: The audit process is very robust leaving no stone unturned in making a determination. Any shortfall or remedial work required is clearly identified allowing you to make the necessary changes to meet requirements. Additionally, we can recommend specialist companies that can assist you in achieving audit status. Q: What do I receive once I pass audit? A: You will receive a letter advising you have achieved the required level and a certificate of Approved Audit Status. Both are provided in electronic form. Note: Safety Set Consulting offers safety training and the Event Safe Audit Program as a service to the industry in the interest of encouraging and increasing the safety of all events. Audit certification signifies curriculum and/or safety process/component completion only. Safety Set Consulting does not represent or certify in any way the actual safety of any event and assumes no responsibility as to the safety of any event or attendee.